Transport materials and products to your employees, increasing quality control and safety. Conveyors eliminate inefficiency and wasted time moving product or traveling to product locations. Gravity conveyors move product either by gravity or manually pushing the product. Gravity conveyor costs less to install and operate and is often used for temporary conveyor lines. Power conveyors use motorized power to automate the transportation of goods. Flexible conveyors expand to fit your product transportation needs and compact when not in use. Flex conveyor can be either powered by a motor or gravity. 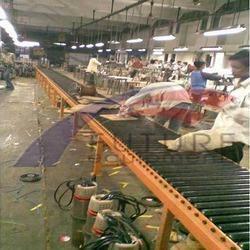 With firm commitment to quality, we are offering superior-grade Live Roller Conveyorto our honorable patrons. 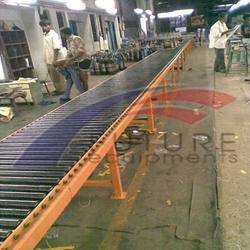 The offered range of conveyors is manufactured by our expert professionals using premium quality raw material and ultra-modern techniques. Available with us in various shapes, these live roller conveyors are used for the material handling purposes.